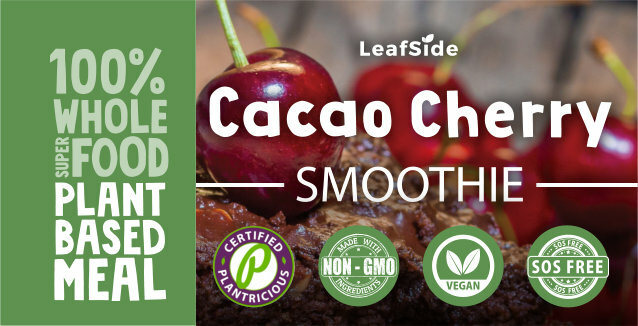 Creamy, rich flavor with raw organic cacao nibs — the least processed, most whole form of “chocolate” with the most antioxidants (more than cocoa powder, or dark chocolate). 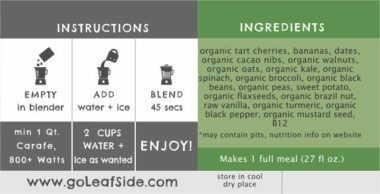 All combined with organic tart cherries, banana, dates, and heavenly raw vanilla — so it’s all actually good for you too! Full Ingredients: organic tart cherries, bananas, dates, organic cacao nibs, organic walnuts, organic oats, organic kale, organic spinach, organic broccoli, organic black beans, organic peas, sweet potato, organic flaxseeds, organic brazil nut, raw vanilla, organic turmeric, organic black pepper, organic mustard seed, B12.